When Mother Duck's eggs hatch, one little duckling is wibbly and wobbly...and very ugly! And no matter how hard he tries to fit in, the other animals just laugh at him. 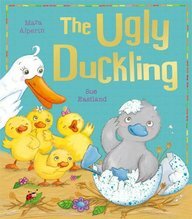 Will the ugly duckling ever find a friend? My First Fairy Tales are a magical introduction to the well-loved stories that are a key part of every childhood. With fresh and fun illustrations, these simple re-tellings of classic fairy tales make a perfect read for young and old alike!